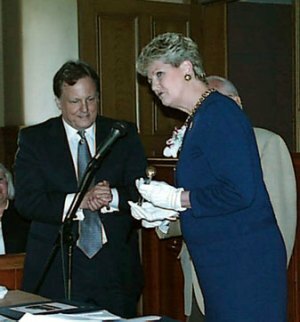 Back on January 22, 2007, the online magazine "Government Technology" ran a profile with Betty Ireland, then the Secretary of State for West Virginia. The article traced Ireland's efforts to bring West Virginia "up to par with the digital age," with technological efforts like e-signatures on government documents. "Can you imagine that -- 147 years we've been sending Caucasian males to run the government here," said Ireland. This kind of remark--in a national online technology magazine--points up the problem many have with Ireland. She's unapologetically offensive. There's just no other way to put it. Perhaps Ireland thinks that she's merely talking straight, and if that means some people get offended, well, that's just their tough luck. But that's not how many others see it. Others discern that there is a broad gulf between telling one's opinion clearly and just being brassy, showing a lack of respect for other people. Think about it: How can anyone who wants to be Governor be successful when they go out of their way to insult over 40% of their potential constituents? Where's the sense of judgment? Simply put, the other "Caucasian males" across the state don't deserve to be thrown in with any lackluster government officials over the years who happen to share their gender and race. How retro for Ireland to even go there. Neither gender and no race possesses a monopoly on wisdom or mistakes in public office. More than most states, West Virginians have traditionally aimed for a colorblind society in recent decades, taking seriously what Dr. King taught about valuing people chiefly by the content of their character. Frankly, we don't know many people in West Virginia who put gender and race first like Ireland does by such remarks. Instead, what West Virginians in both parties value in any candidate is a vision for the state's future and basic competence. For most West Virginians, Ireland's divide and conquer attitude towards others not exactly like her is distasteful. We hope Ireland can join the 21st Century soon. It's a place where race and gender may still be factors but not the main factor anymore.